Mind the poop - are pets in the workplace a good idea? There was the time when Stanley left a little poo under Clare's desk. And the time Nathan flatly refused to work on the same floor as him citing allergy problems. Plus, for the first few weeks staff productivity must have dropped 50%, as we all lined up to have our little play with the cutest fluff-ball we'd ever seen. We really weren’t sure we'd made the right decision allowing Aimee's new puppy to become our resident pet. As it happened, out of something quite practical in helping Aimee find a solution to owning the puppy she’d always dreamed of, we actually ended up enhancing our company brand. “Oh, are you working from home today?” asked a client whilst I was on the phone to her. “No, I’m in the office, why do you ask?”, I replied. “I thought I just heard a dog yapping in the background.” “Um… yes that is a dog you can hear. You can come and meet him if you want? What an ice-breaker he was. He happened to be based on the same floor as the main meeting room so we'd always ensure a brief intro to Stanley if we were hosting a client meeting. It became more important than trying to catch the CEO in the stairwell, because everyone without fail either fell in love with the little chap, or were at the very least completely bemused by him. Once they'd met Stanley, they'd physically relax and open up, almost as if they trusted us more. So, I've just come out of one of our monthly Benefits Excellence seminars where our long standing client, Grant Thornton, presented a case study on their RG success. I had to smile when little Stanley was attributed to as one of the reasons why they love to work with us. Our relentless innovation and obsessive nature over perfection and usability didn't get a look in… It was our resident RG dog! There’s something to be said for allowing pets in the workplace. Not only does it indicate a level of trust in your employees (not to mention a serious nod to flexible working) - it actually makes the office feel more like a home, instead of a characterless corporate work station. 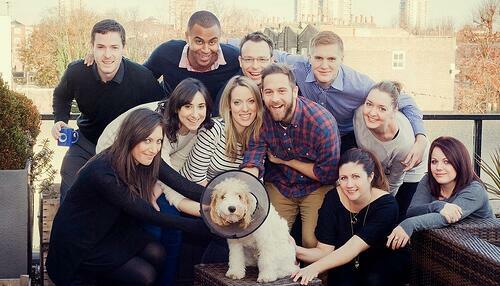 Pets in the office aren’t for every company, but why not try a “bring your dog to work” day? There may be fewer “accidents” than you thought.